The significance of nitrates in the aquarium is arguably less understood by fish keepers than the effect of ammonia and nitrites. Although nitrates are not directly lethal in the way ammonia or nitrites are, over time high levels of nitrate have a negative effect on fish, plants and the aquarium environment in general. Fish will feel the impact of nitrates by the time the levels reach 100 ppm, particularly if levels remain there. The resulting stress leaves the fish more susceptible to disease and inhibits their ability to reproduce. High nitrate levels are especially harmful to fry and young fish and will affect their growth. Furthermore, conditions that cause elevated nitrates often cause decreased oxygen levels, which further stress the fish. Elevated nitrates are a significant contributor to undesirable algae growth. Nitrate levels as low as 10 ppm will promote algae growth. Algae blooms in newly setup tanks are usually due to elevated nitrate levels. Although plants utilize nitrates, if nitrates rise faster than the plants can use them, the plants can become overgrown with algae, ultimately leading to their demise. Nitrates are a by-product of nitrite conjugation during the latter stages of the nitrogen cycle and will be present to some degree in all aquariums. Detritus, decaying plant material, dirty filters, over-feeding, and overstocking the tank, all contribute to increased production of nitrates. Water used to fill the aquarium often has nitrates in it. In the United States, drinking water may have nitrates as high as 40 ppm. Before adding water to your tank test, it for nitrates so you know if the levels are unusually high in your water source. If nitrates are above 10 ppm, you should consider other water sources that are free of nitrates. In nature, nitrates remain very low, generally well below 5 ppm. 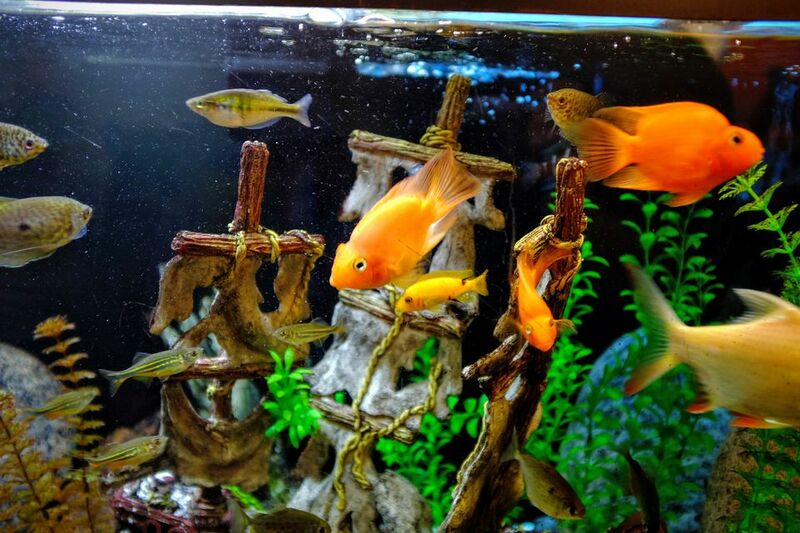 In freshwater aquariums, nitrates should be kept below 50 pm at all times, preferably below 25 ppm. If you are breeding fish, or are battling algae growth, keep nitrates below 10 ppm. Unlike ammonia and nitrites, the bacteria that remove nitrates do not like oxygen-rich environments. Therefore, conventional filters do not harbor the bacteria that remove nitrates. Although special filters exist that will remove nitrates, such devices are usually expensive compared to other filtration units. However, there are some steps you can take to keep nitrates low. Keep the tank clean – Waste ultimately produces nitrates. Cleaner tanks produce fewer nitrates in the first place. Don’t overfeed the fish – Overfeeding is a significant contributor to excess nitrates and other undesirable wastes, such as phosphates. Water changes – Performing regular water changes with water that has little or no nitrates will lower the overall nitrate level in the tank. RO/DI water is an excellent choice for keeping nitrate levels low. Keep live plants – Live plants utilize nitrates and will help keep nitrates in check. Use nitrogen removing filter media – Instead of an expensive denitrator or special filter, use special media in the filter you have. Although they will not lower nitrates dramatically if used together with other methods the net result will be beneficial.